Jim G had the most liked content! Mine was the ZK bodywork if that helps. Last chance before my membership runs out..
New mini type ignition/steering lock. Still for sale. Lower price. Bonnet to fit wide bodied ZK Westfield in excellent condition. No holes apart from for standard bonnet locks and front locating pins. Colour is Post office red. Can be crated up in plywood box but buyer will have to arrange courier and pick up. £140 Location is Ripon North Yorkshire. Tel: 07966414017 Thanks. Here’s mine, if you’d like to have a look... 2015 Westfield for sale. I’ve decided to sell my Westy.. Factory Built 2015 Westfield ZK Special Edition 2.0 Zetec. This is the one you have been waiting for... It is without doubt one of the cleanest Westfields in the country. It is factory built and registered in August 2015. I have a comprehensive build folder and every single receipt for the car. It comes with - Special edition ZK body and V8 Bonnet. (Standard bonnet is available if preferred) Lowered floor. Carbon look front guards and rear stone guards. 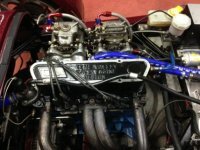 Polished, brand new at build, 2.0 Zetec Blacktop running Omex Throttle bodies and Omex 600 ECU and Omex Shift Light. Stainless Exhaust. Alloy Header tank. 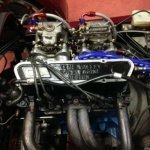 Setup on Dyno at Northampton Motorsport and running 175 bhp. Just serviced today, 1/9/15. Type 9 5 speed box and LSD. Protech shocks all round which were serviced, a couple of months ago, and revalved with the latest valves by Protech. Go-Race quick release column and boss with Momo 290mm leather steering wheel. Carbon effect rear lights. Heated windscreen. Push button start. Special edition Leather sports seats. Programmable Speedo able to do standing 1/4 and 0-60 times. Lockable bonnet and boot. Full Westfield wet weather gear, Doors, Hood and retractable frame. Wind deflectors. Westfield brake calipers. Front carbon canards and relocated LED indicators. Rubber mats and factory carpet ones included. TRS four point harnesses. Rear diffuser. Storage nets for your bits n bobs. 5256 miles Mot till August 2019. V5 in my name. The price is £14500 Viewing is essential, I can guarantee you will not be disappointed. The underside of this car is as clean as the top. I also have a Softbits half hood and a Softbits Storm cover. Both unused. Also a brand new set of Yokohama AD08’s. These will be offered to the buyer first for an extra cost. I’d go for either body shape, it would be spec and price that swayed me one way or the other. Whats yours called and why! ‘Rosie’ because the wife likes to name things..